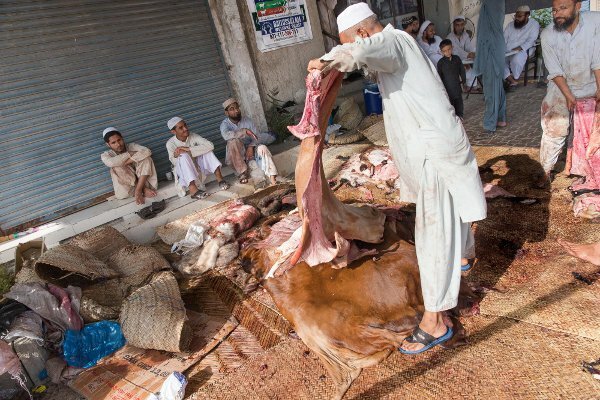 Eid animal slaughter in Pakistan: Stolen hides, money laundering, and funding the jihad — 1389 Blog - Counterjihad! Eid has turned hides into a black market currency. Pakistan’s largest city is equally known for crime as for cosmopolitanism, and the Eid holiday is just as rife with threats and wrongdoing as any other day of the week. In a place where anything from a goat to an iPhone can be stolen at gunpoint, so too can the skins of the sacrificed animals. Even before the animal has been portioned up, Karachi’s criminal elements look for their way to step in. Strongmen of extremist religious groups and religious charities (fake and real), political party workers, and small-time criminals: they all look to profit from the sale of the animals’ hides. Yes, the seminary wrote back, one should give the hide if one’s life is at risk, and also donate an amount equal to its price. “If an animal is shot and then sacrificed, eating its meat is halal and if this happens during the days of the sacrifice then the sacrifice will be considered to be lawful,” the fatwa text stated. The hides racket is a dangerous one, given the mix of extremist and militant groups involved. But this isn’t a small-time operation. Anwar Kazmi, a veteran officer of the Edhi Foundation nonprofit, speculates that the business of hides may be worth billions of rupees. But why hides? “It is money you can’t audit,” he says. In 2011, the Supreme Court mentioned the fight for hides in its judgment on the state of lawlessness in the city. This year a government-sponsored PSA aired at a local cinema, encouraging people not to donate to unknown groups, lest their donations end up funding terrorism. “It’s black and launderable money in that sense,” says Hamid. As Eid nears, charity groups plaster Karachi with banners and billboards, advertising shares in collective slaughters and asking for donations of hides. They pull out all the stops: The charity wing of the Jamaat-e-Islami—one of Pakistan’s main religious-political parties—asks for hides through a billboard featuring the image of Aylan Kurdi, the Syrian toddler whose body washed ashore in Turkey. The Falah-i-Insaniat Foundation—a self-described charity that is accused of being a wing of the banned Lashkar-e-Taiba militant group—advertises donations for its work in Afghanistan, Syria, Palestine, Pakistan, Burma, Somalia, and the disputed territory of Kashmir. The journey of an animal from the VIP tent to its stolen hide ending up in Lyari is months and years in the making, as cattle farms raise their finest animals or import cows from Australia. But word of mouth, reputation, and rumor aren’t enough to move cattle. Traveling to markets and farms is inconvenient, and many farms aren’t even accessible to regular visitors. But if Mohammad won’t go to the cattle, the cattle will come to Facebook. 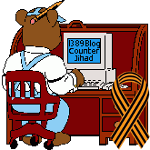 Next post: Could Nuland’s hand-picked “Yats” be stealing $$$ from the cookie jar?